Pembrey and Burry Port is a fast developing community situated on the coastal belt of the Carmarthenshire Burry Estuary, a protected haven retaining its natural beauty. The historic harbour contains 450 pontoon berths for small leisure craft and the town offers a selection of restaurants, café’s, pubs and a supermarket amongst other facilities to serve the third largest town in Carmarthenshire. Lying on the Millennium Coastal Path and is very popular with ramblers, offering over 25 miles of walkways and bridleways and cyclists with the National Cycle Network. The award winning Cefn Sidan Beach with 7 miles of golden sands at Pembrey Country Park is one of the top visitor attractions in Wales, offering a beautiful beach with breathtaking views of the Gower. The Memorial Hall with its newly refurbished kitchen is available to hire for functions and events, and can seat up to 360 people, plus 80 stage crew maximum. The OAP Hall has full kitchen and WC facilities and can seat up to 55 people. 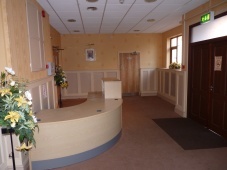 Disabled Access to both halls. The former Copperworks School site is available for hire to groups and rehearsals and is currently used by the Scouts & Girl Guides, Burry Port Town Band, Aikido Society and Pembrey & Burry Port Photographic Society. There is a stage, newly refurbished kitchen with fitted appliances, Male and Female toilets, sound box, heating and disabled access. The Memorial Hall will be on the left.